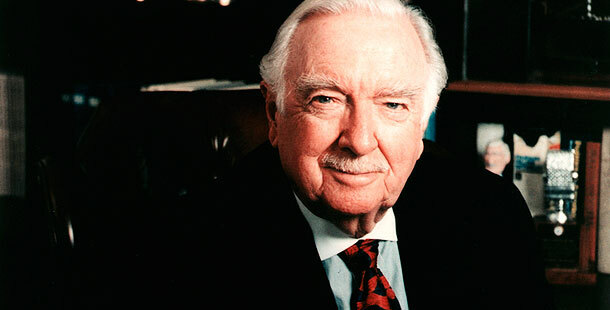 Walter Leland Cronkite, Jr was born on this day in Saint Joseph, Missouri, USA in 1916. Today is the 98th anniversary of his birth. Walter was the oldest of six children. The Cronkites lived in Kansas City, Missouri (where young Walter was a paper boy for the Kansas City Star) until 1926 when the moved to Houston, Texas. At San Jacinto High School he worked for the school newspaper, eventually becoming editor. According to Boy Scout lore Cronkite wanted to become a newsman after reading an article reporters in Boys Life Magazine. He went to the University of Texas at Austin but dropped out in his Junior year to start working as a reporter. He worked for a number of newspapers (including the Huston Post) and radio stations (under the name “Walter Wilcox”) reporting the news and sports. During World War II Cronkite became a War correspondent covering the North African and European campaigns for the United Press. After covering the Nuremberg Trials for that organization he was recruited to CBS News by Edward R. Murrow. Cronkite started at the Washington, DC affiliate for CBS. He was “The most trusted man in America” and he covered events from the assignations of John and Bobby Kennedy and Martin Luther King, to Apollo 11 landing on the Moon, to Watergate and Vietnam. He also hosted: You Are There, a historical reenactment program; The Twentieth Century, a documentary using newsreel footage to explore historical events; and a game show, It’s News to Me. He retired in 1981. He continued to report as a special correspondent and presenter. Walter Cronkite passed away on July 17, 2009 in New York City. This entry was posted on Monday, November 5th, 2012 at 12:55 am	and tagged with CBS Evening News, Walter Cronkite and posted in American History, Neil Armstrong, Non Fiction, postaday, Thought of the Day, Today's Birthday, United States, Walter Cronkite, World War Two. You can follow any responses to this entry through the RSS 2.0 feed.